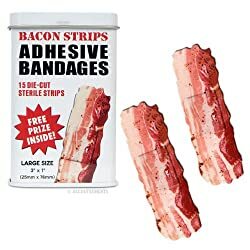 BACON shaped themed Adhesive Bandages Looking to add a little sizzle to your next flesh wound? Tired of the same boaring bandages? Not to pork fun at an injury, but nothing strips the pain away like meating friends out dressed like this. "That's sow wrong, George!" they squeal. But fat chance they let such a pig idea go. In fact, they often rip it off quickly--after giving me the cold shoulder.